The Antiope Naked Shower Gel has followed in the footsteps of the Tender is the Night naked shower cream; It is the second packageless ‘naked’ shower gel/cream that Lush have dared to only release in a naked form. Although I wholeheartedly miss the bottled seasonal gel and creams we have previously been spoilt rotten with, I know in my heart that plastic is actually just a luxury and that making and using it in such huge quantities does more bad than good to the world. Through the exploration and inventing of packageless products Lush are proving that plastic packaging for cosmetics isn’t the only manufacturing and distribution route we can follow now and in the future. Whatever you believe in regards to the naked Lush products, we all know that they are a small yet positive step in the right direction of helping save the planet we live on. If the release of ‘naked’ products gets people talking and consciously being more responsible with plastic, then Lush have achieved a lot more than any other cosmetic companies thus far. My first impression of the Antiope naked shower gel was how incredibly bright it was. After a long and dull Winter its brilliant and bold yellow colour sure was a sight for sore eyes. There’s just something about it that radiates the sunshine, out of all of the Mother’s Day 2018 stock it was the Antiope that I was immediately drawn to. That was until I smelt it. I’ve heard a fair few crazy descriptions of the Antiope’s scent, it’s more than unique and definitely one of those scents that will forever be an interesting topic of conversation amongst Lushies. To me, with it being unused and just in my hands it smells of leaf compost in the Spring time; The Spring time being a dryer and slightly warmer time of year, by this I mean it isn’t a muddy scent but still has earthy, dry elements to it. This scent obviously wasn’t what I had expected at all and this expectation is reflected in a lot of other people’s reactions to first sniffing Antiope too. Containing Amazonian clay, Brazilian orange oil and limonene you’d expect Antiope to be fruity-sweet upon first sniff. The collector in me still decided to buy some Antiope, with its scent not being my usual go-to, it did take a bit of persuading back and forth in my head to actually use it. One night I decided to just go for it and took it into the shower with me. We have just had a new shower fitted so I didn’t have any excuses to not try it at least once. Once I’d let the shower gel run under the hot water for a few seconds it was ready to start lathering up. You use a naked shower gel just as you would a normal shower gel. Instead of fiddling with a lid and then squidiging the product out of the bottle you now just have to lather the naked shower gel similar to how you would a bar of soap. Antiope lathered up quickly and with minimum effort, its lather was highly pigmented in colour and a little of it went a long way too, even when it was well and truly rubbed into my body it remained a bright yellow, the brightness of it was just as bold as the Yuzu and Cocoa shower cream. As soon as the hot water came into contact with the Antiope its scent completely changed. The earthy tone it had when dry was still noticeable (albeit much more subtle) but it also suddenly become very sweet, I’d describe it as almost pineappley. At first I thought my nose was playing tricks on me so I lathered up some more, my nose wasn’t however paying tricks on me! its scent had suddenly became very, very desirable. When first lathering it up I did get a little scared at the intensity of its colour, I felt like I was turning myself into a character from the Simpsons. It however rinsed off just like any other Lush shower gel does and I was pleasantly surprised with how cleansed and smooth it left my skin. Once out of the shower I couldn’t smell the earthy tone of the shower gel on my skin anymore, there was a very gentle scent of sweet pineapple left behind and that lasted for a few hours after. The only problem I really had with it was storing it after use. The Lush naked shower gel and creams are double the concentrate of the liquid shower gels and for the Antiope in particular with it being such a bright yellow it caused a little problem. For all of the other naked products I have, after use I leave them out on a metal rack to dry out as instructed. I found that Antiope was a bit of a dripper though. My husband walked into the bathroom about 20 minutes after I had left. Where the Antiope had dripped so much he thought that I had, had a wee in our shower and not washed it away! *cringe*. I made him smell it to prove my innocence and luckily he believed me… It’s not ideal for drying it out but leaving it in a metal Lush tray instead saves any mess or unwanted shower-wee-wee accusations. All in all I did like Antiope, it’s one of the best examples of why you should always give a Lush product a try even if not impressed at first sight, or for Antiopes sake, first sniff! We however didn’t have to wait long as back in July the jelly face masks became available in all stores. I always use a clean tea spoon when it comes down to getting Lush face masks out of their pot. I use a spoon to apply the fresh face masks too, I feel it helps the product to last longer, so many people complain about the fresh face masks having such a short shelf life. My method for using a spoon is to stop any cross contamination happening, grabbing a chunk of it out of the pot with your fingers is quick and easy BUT it risks the chance of bacteria from your hands getting in to the rest of the product that you want to save for another time. Using your fingers even if washed well can leave the leftover product to go mouldy very quickly. Since I started using Lush face masks with a spoon my face masks last months and months passed their sell buy if kept in the fridge too. Containing calamine powder, neroli oil and rose absolute, there are certain elements to FOMO that remind me ever so slightly of the Don’t Look at Me fresh face mask and the Rose Jam shower gel. When it comes down to the application of the jelly masks it is completely different from how you would apply the fresh ones. Once you’ve spooned a grape sized amount of jelly from the pot you then work it in your hands to form a paste. This action is very similar to what you do when using the fresh face cleansers however you do not add water. Unlike the fresh face masks the new jelly face masks do not need to be kept in a fridge, I however do store them in a fridge. 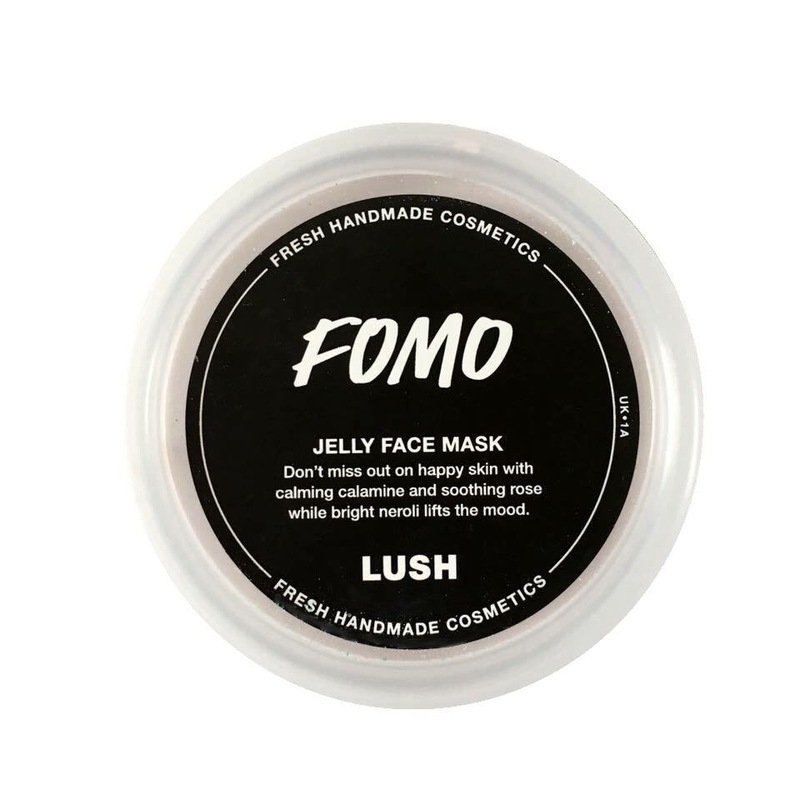 Jelly masks also have a much longer shelf life than their fresh-face-mask equivalents. You can easily get 6 to 8 masks out of just the one pot. 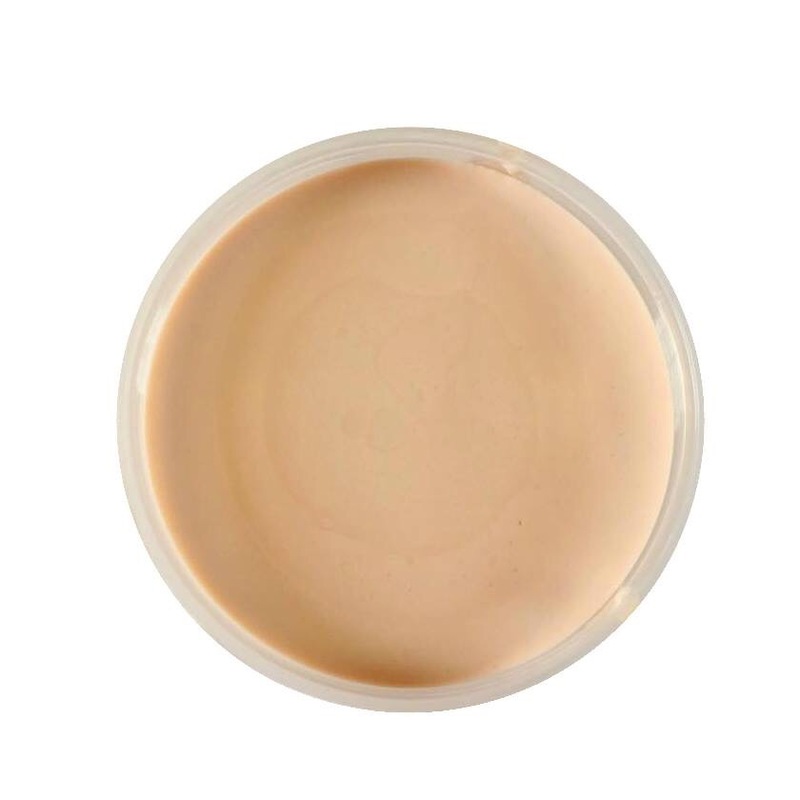 It forms up a paste very quickly and application is mess-free, quick and easy. After 15 minutes it is time to take the face mask off, I use a hot and wet flannel. It comes off easily and no residue is left on my face at all. Once the face mask was off my face felt brand new, the redness had gone down and my face was super soft and perfectly hydrated.